It's cookie season! Oh, sure, cookies are eaten 365 a year, but is there a better time to celebrate cookies than during the Christmas season? Even the most baking-averse among us can't help but bake cookies in December (though they may just be sugar cookies cut out from a can). So during this Christmas cookie season, I'm sharing 10 tips for baking, storing, and freezing cookies. And if you need some cookie recipes, Food Blogga has several hundred of them that have been submitted by bloggers and bakers across the country for previous "Eat Christmas Cookies" events. Here are links to the 2007 round-up, the 2008 round-up, and the 2009 round-up. From Italian pizzelle to German Spritz cookies, you'll find absolutely every type of cookie imaginable! 1. Before you begin baking, make sure you have all requisite ingredients as well as baking utensils, pans and parchment paper (lots of parchment paper). Baking requires precision, so it's a good idea to use the exact ingredients specified in a recipe rather than make substitutions that can adversely affect both texture and flavor. 2. In general, cookie dough should be mixed by hand or with an electric hand mixer. Over mixing can lead to tough cookies. 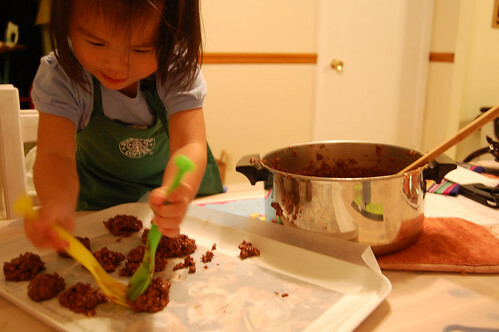 Stir in ingredients such as chocolate chips, nuts, and dried fruits by hand. 3. Use sturdy, aluminum baking sheets with or without a rim. Skip greasing the sheets and line them with parchment paper instead. This helps the cookies bake more evenly, makes it easier to slide them onto a cooling rack and allows for quick clean-up. 4. Always preheat the oven. Space cookies at least 2 inches apart; even cookies that don't spread a lot need their space to bake evenly. If your first sheet of cookies spread too much, then chill the remaining cookie dough in the fridge for 10-15 minutes before baking. 5. If possible, bake one sheet of cookies at a time. This allows the oven’s heat to circulate evenly and prevents cookies from becoming too browned on the bottom. If you must bake more than one sheet at a time, then place sheets in the top and bottom thirds of the oven and rotate mid-way through. Never place cookies on a hot baking sheet as they will spread; either let the sheet cool or run it under cold water before re-using it. 6. Unless otherwise noted, transfer cookies immediately to a cooling rack. Just slide the parchment paper with the cookies on it directly onto the rack. Cookies will firm up a bit as they cool. Allow them to cool completely before frosting. 7. Make sure cookies are cooled completely before storing. Metal tins keep cookies crisper and firmer than plastic containers. 8. Store soft cookies like macaroons in a separate container from hard cookies like biscotti. Otherwise, you’ll end up with all soft cookies. 9. Layer cookies between sheets of waxed or parchment paper to maintain freshness and to prevent them from sticking together. Sturdy cookies such as biscotti can be stored without the paper. Use the same storing principles when giving gifts of cookies. Festive decorative tins and cellophane bags are both attractive and practical. 10. Most types of cookie dough can be frozen raw then baked later, though drier cookie dough such as shortbread freezes better. 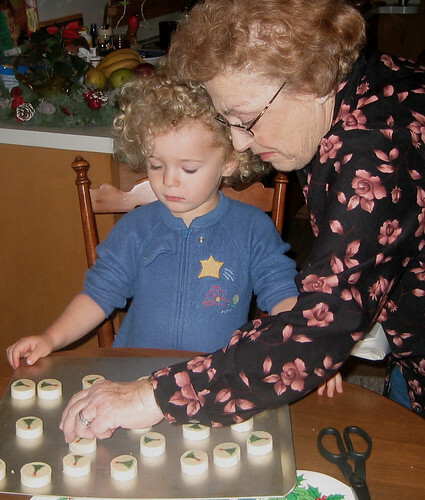 Place formed cookies on a parchment-lined baking sheet and freeze until firm, about 1 hour. Place cookies in a freezer bag and freeze for up to 3 months. There is no need to thaw them; just add a few minutes to the baking time. To freeze baked cookies, place them in single layers separated by sheets of waxed or parchment paper and store in a freezer-proof, air-tight container. Baked cookies can be frozen for up to 6 months and should be defrosted on the counter top before serving. Oh, and don't forget to leave some cookies for Santa Claus on Christmas Eve. Next to Cookie Monster, no one loves cookies more than old Saint Nick. Photo credits: FCC, Sponselli, cathyse97, conniefoggles. Cute photos. On the rare times that I make cookies I like to freeze most of them so I'm not tempted to eat them all at once, and it's nice to pull one out every so often! Yay for cookie season! Great post! Cute pictures! I made those Christmas Tree cookies with my niece last Christmas Eve for Santa, although at the last minute, she suddenly had second thoughts about giving the cookies away and had to be convinced! kalyn-Aren't they? Thank goodness for FCC! That's a great tip, Kalyn. These are great tips for baking cookies. I will br referring to this post for my classes! lovely tips - I am a bit ad hoc with cookie baking but I do quite a few things you suggest - parchment paper is such a great invention!